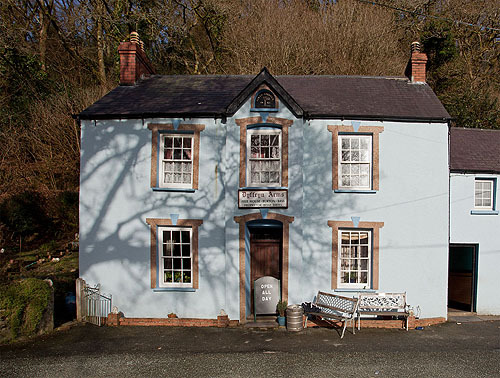 Dyrffryn Arms is a celebrated public house in the Gwaun Valley . It is in a sunny position overlooking the Afon Gwaun. Bessie Davies family have been running the pub since 1840 , Bessie for more than 40 years, and known locally as Bessie's, it is a simple room in the front of her house. It’s like stepping back in time, Bass draught beer is served with a jug straight from the barrel , though a hatch in the wall .